LiveCode LessonsLiveCode LessonsHow To - LiveCode Mobile Tasks iOS TasksHow do I set up an App for Submission to iTunes Connect? This lesson describes how to submit information to Apple, prior to uploading a LiveCode application. It is assumed that you have signed up to the iOS Apple Developer Program and have appropriate privileges to access iTunes Connect. Screen captures that outline the steps are provided. Before you can submit an application to the Apple store you must first set up information about the application you plan to submit. You can provide this information to Apple using iTunes Connect. The information discussed here is reduced and is also covered on the Apple website. 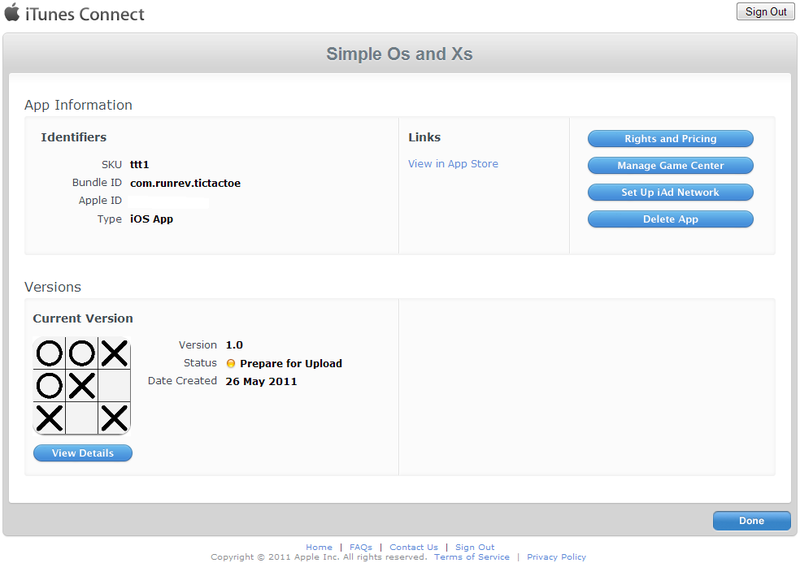 You can download more detailed information on the steps listed here from the iTunes Connect Developer Guide. Note: The online form contains a number of circled question marks that provide you with hints and support if you require assistance with some of the information that is required. 1. The App Name that is to appear in the App Store. 2. The SKU Number which is a unique identifier that you can use to identify your application. 3. The Bundle ID that is used to uniquely identify your product with Apple. The date and pricing page allows you to specify when your application is to become available and how much you expect to be paid for people downloading your application. You can access the pricing matrix to determine the amount paid to you from a specific price specified. This page also provides a link to specific stores, allowing you to specify regional stores from which your application should be accessible. Move to the next page by selecting Continue. The Meta Data, Rating, EULA and Uploads page allows you to provide information that is used to associate your application with search queries, contact information, an age rating, a license agreement and images that can be displayed at different stages when potential customers browse for your application or download it to their device. Once you have provided all the required information, select Save. Note: Be sure to create images with the correct dimensions for upload. Incorrectly sized images will not load. Once you have saved all of the required information, you are presented with an application information page. From there, select View Details to take you to the View Details screen. Then select the Ready to Upload Button. You are then required to answer a question about export compliance. Once you have completed the compliance requirements, you can move onto Ready for Upload. You are now ready to build an app for distribution by following lesson: How do I Submit an iOS App to the App Store? Note: You can only load your application using the Application Loader, once the status of your application is Waiting for Upload in iTunes Connect. Prev: How do I Submit an iOS App to the App Store? launch the Assistant, and in 5 minutes you are ready to go. After submitting an app to iTunes how do I change the answers to questions regarding Export Compliance? setting the Export Compliance is part of the app store submission process and requires you to follow the process that Apple stipulates. Apple provides information on setting that information on their "Adding New Apps" page under the heading: "Authorizing for Export and Indicating Legal Issues. You may have to expand the information by selecting a little triangle. But to my knowledge I did all steps for getting the needed certificates from the iOS Developer site. Even if that seems not to be a livecode problem but more an apple problem, I am unable to solve it. And thus I am unable to distribute my Livecode app. Are you using your distribution certificate to build the standalone you are uploading to iTunes Connect? You can't use a development certificate for distributing your app. I would also suggest checking your certificates and provisioning profiles on the Apple Developer site and making sure everything looks ok.